As you pass by the outside this does not, by any means, seem like a fancy place. In fact, the small staircase going up and wood panel walls make it seem almost like a “cabane a sucre” The inside is simple with tables and chairs lined up in an orderly fashion and a television in the corner. The staff spoke to me in Spanish and it was nice to bust out some Spanish although after realizing that my Spanish was way too rusty, I changed to English. The place is a definite local hangout with lots of people who work in the area ducking in to eat and the fact that they serve breakfast all day long is a nice bonus and gives it that personal touch of “if the kitchen’s open you can order what you want”. 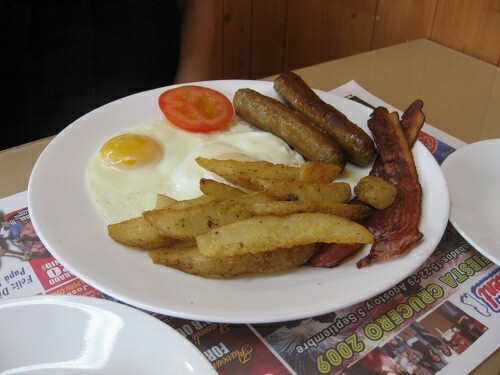 With the breakfast menu available all day long you can fill that craving right up until the evening. Now, the menu is a few items long and has a definite Salvadorian flavour. 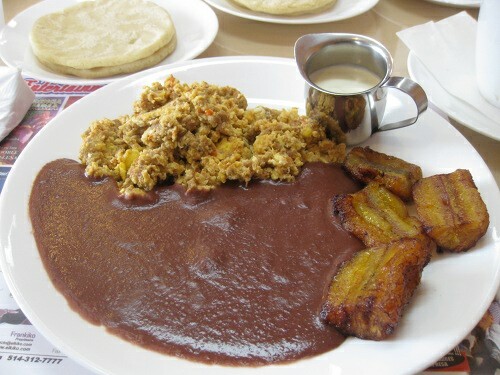 Many of the dishes have classic South American food items such as beans, salsa, and fried plantains. There are six menu items ranging from $2.50 to $7.00 and all of the plates come with coffee (imported from El Salvador) and a choice of toast or tortilla. Almost all the dishes have a meat option in them and half the plates come with casamiento (rice and beans). The coffee was really good and the fact that its imported from South America makes it seem even more authentic, although I did not get a chance to ask if it was fair trade. 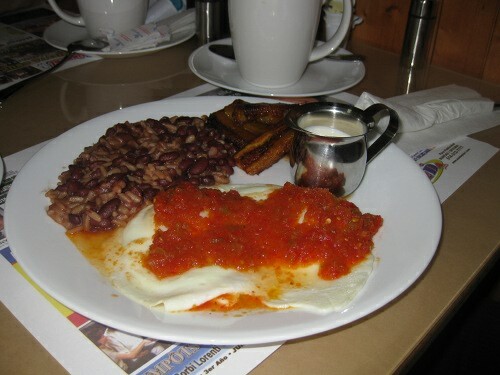 My friend had the eggs Rancheros ($7.00), which is eggs with salsa, rice, beans, plantains and cream. The salsa and egg mix was nice and light which worked much better than a heavy sauce would on an egg; the plantains were a nice touch to the dish and the rice and beans were tasty although I had initial reservations for rice and beans on any menu, but those reservations were put to rest. I ordered the number 4 which was fried plantains, fried beans, or casamiento and cream, I opted for the fried beans over the casamiento which, after tasting both, I am still happy with my choice. The plantains were a very interesting addition and offer that tropical taste while still keeping it “brunchy.” I had chosen the tortilla as opposed to bread and it was very helpful in scooping up the beans and every once in a while I would top it with the cream. Now some people slap on the cream like its gravy on a thanksgiving turkey. I, however, used smaller portions since it can get a little too sweet and thick and I liked using it to compliment and not overpower it, although some people may chose otherwise, it’s a personal choice so go nuts. Service is nice. It’s a small place and there were not too many people on the weekend. In fact, its likely more busy during weekdays with everyone coming in who works there. The lady who sat us spoke Spanish so it was fun to chat a little and work on my rusty Spanish but our server was a different guy who was really nice and did a good job of explaining the menu and was really chill. My coffee was refilled frequently which made me a happy camper and the all of the staff was pleasant. Almost half the plates are vegetarian and that’s the great thing with South American cuisine – they somehow are able to make hearty vegetarian dishes. Although, don’t expect any health dishes with fruit cups or egg white omelet’s, although the food does qualify as a vegan option which is quite rare to find on a menu. I really liked the idea of a South American themed breakfast. 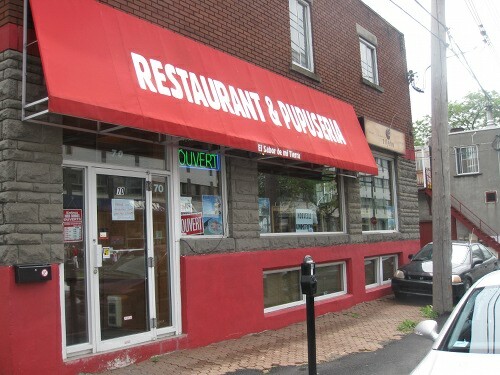 It was well priced, the staff was friendly and offering breakfast/brunch all day long is always a plus in my books. The menu is a tad limited in offering, and the health options are non existent, although kudos on having vegan options which is something I did not expect. It may not be fancy cuisine but it is hearty, honest and really well priced, so if you are in the area, or want to check out somewhere else that offers vegan brunch, Sabor is the place for you. Tuesday – Wednesday 10:00 a.m. – 19:00 p.m.
Thurs-Friday: 10:00 a.m. – 21:00 p.m.
Saturday 10:00 a.m – 21:00 p.m.
Sunday 16:00 p.m. – 22:00 p.m. Excellent work. You have gained a new reader. I hope you keep up the good work and I look forward to more of the same absorbing posts.